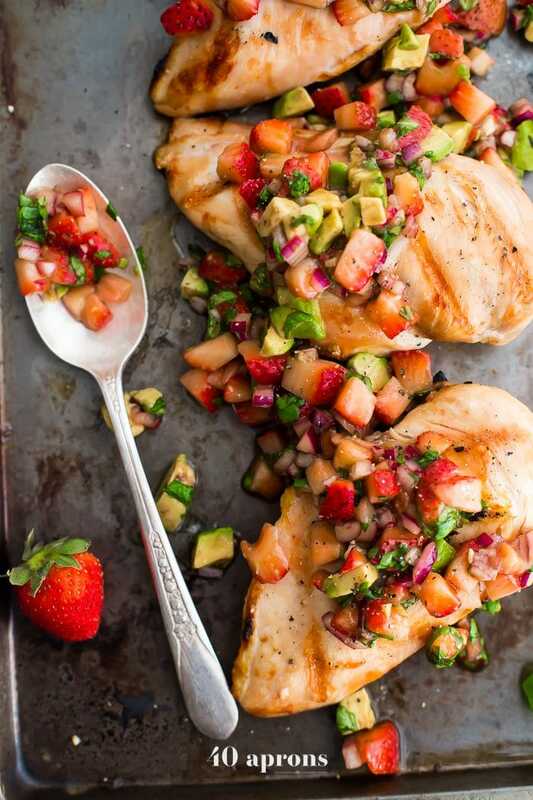 This Whole30 strawberry basil chicken with avocado is the ideal Whole30 grilled chicken recipe: quick, flavorful, and a little sweet! The perfect Whole30 dinner for those nights when you can’t stand yet another savory recipe. While this Whole30 strawberry basil chicken with avocado is totally Whole30 compliant, it’s perfect for anyone! Strawberry basil chicken needs to be a thing in your house… like yesterday. Most of the time, recipes are the result of brainstorming and planning, adding ingredients to my grocery list and putting their title in Evernote with a checkbox. I casually sift through the photos after shooting and mentally table the recipe for later, for after the mermaid popsicles or the paleo flag fruit tart or the peanut-free chicken satay. Other dishes are already queued, having waited patiently in line. 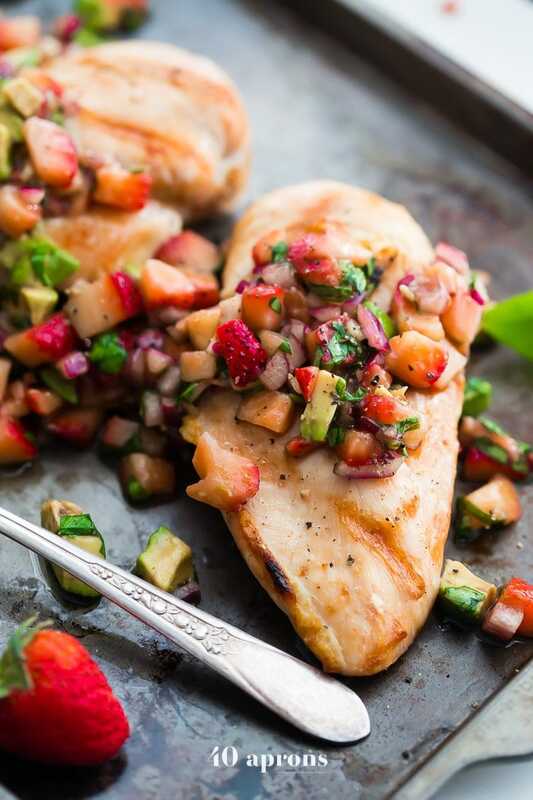 You can’t just cut right in, Whole30 strawberry basil chicken (with avocado!!!). Well, actually… I think we’ll make an exception for you. This weekend, I was feeling a bit blah, not terribly interested in cooking or eating. I had a one-pan chimichurri chicken and asparagus recipe planned for that evening, but I just wasn’t feeling it. O tempted me into going out for Mexican, but we’d just been going out so much lately. No, we need to eat at home. But the only thing that sounded good was a sweet and super easy recipe. After a day spent running errands and planning for Father’s Day, the last thing I wanted to do was hover over the kitchen counters, spending my time standing and writing and analyzing. No, if I were going to be cooking, it needed to be outside with a glass of wine in hand. And it hit me all of a sudden: combine a few fresh ingredients, so abundant this time of year, and slather it on a beautifully grilled chicken breast. Easy, fast, delicious. Sold. We’d been stocking up on fresh strawberries lately, since it sort of seemed like they were giving them away for free at Sprouts last week, and I’d picked up a basil plant while I was there. Strawberry and basil is everyone’s favorite summer power couple, right? From strawberry basil lemonade to strawberry basil cocktails, I’m kind of obsessed with how the fruity pairs with the herbal. The fact that I’d never had the combo in a savory dish? That needed to change. 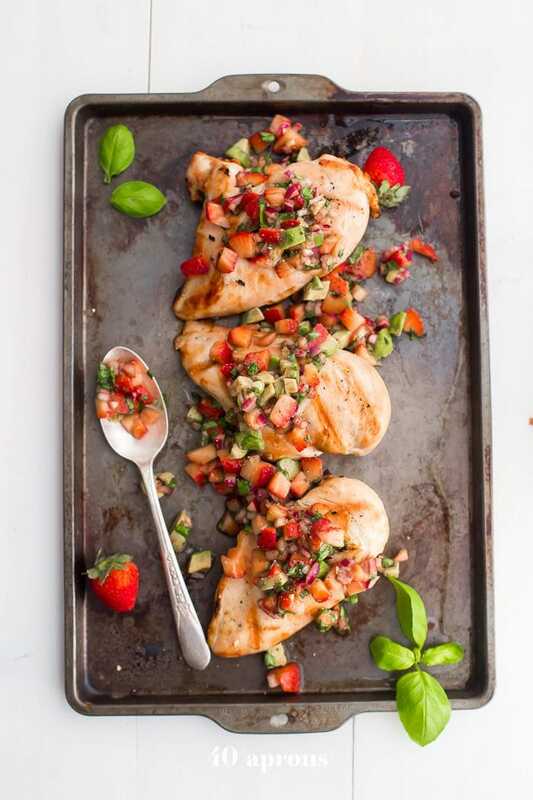 I quick brined the chicken breasts, to make them a bit more forgiving and flavorful on the grill, and made the strawberry basil avocado salsa in the meantime. Threw the chicken breasts on the grill, and a little while later? Dinner is served. That took, oh, like no energy? Perf. This Whole30 strawberry basil chicken (with avocado!) is a perfect Whole30 dinner in the summer, because a) it’s light and refreshing yet filling, b) you don’t have to turn the oven on, c) you get a break from the constant parade of totally savory dishes, d) get to make good use of that grill! Don’t skip the brine, pounding the chicken breasts, or watching the internal temperature of the chicken, or you run the risk of drying them out. Chicken breasts are typically so thick that they can be difficult to cook all the way through without overcooking them. The brine is super fast, too. So worth it! 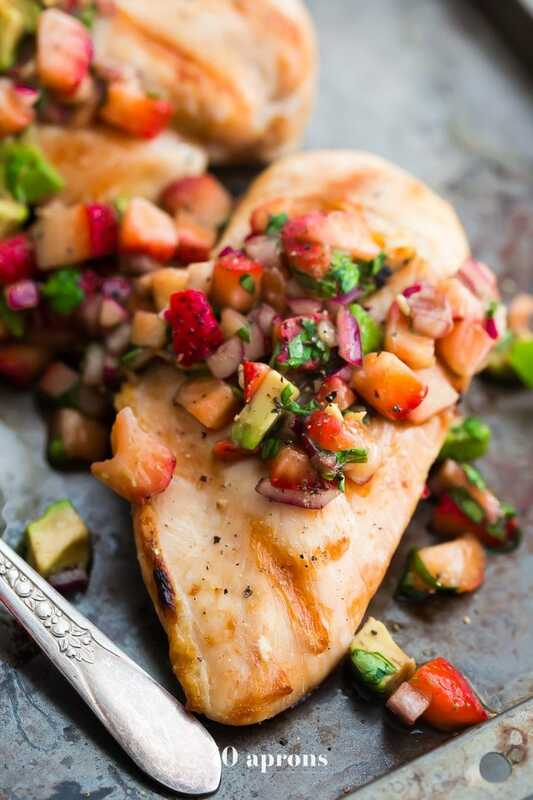 This Whole30 strawberry basil chicken with avocado is the ideal Whole30 grilled chicken recipe: quick, flavorful, and a little sweet! The perfect Whole30 dinner for those nights when you can't stand yet another savory recipe. While this Whole30 strawberry basil chicken with avocado is totally Whole30 compliant, it's perfect for anyone! Strawberry basil chicken needs to be a thing in your house... like yesterday. Stir together kosher salt and 1 quarter warm water in a plastic gallon freezer bag or large bowl. Add chicken breasts and let sit at least 15 minutes, preferably about an hour. Meanwhile, make your strawberry basil avocado salsa: stir together all ingredients and salt to taste. Prepare your grill: lightly grease grill grate and preheat to medium-high heat, about 450º F. After brining, remove chicken breasts from kosher salt mixture and pat dry. Sprinkle with salt (not quite as much as you'd usually use, since they've been brined) and pepper, to taste. Grill about 18-23 minutes, until internal meat thermometer reads 159-160º F. *Monitor smallest chicken breasts first,* and remove them when they come to temperature, then test larger breasts. Monitoring the largest first will leave you with the smaller ones being overcooked, but pounding the chicken breasts will help this issue. 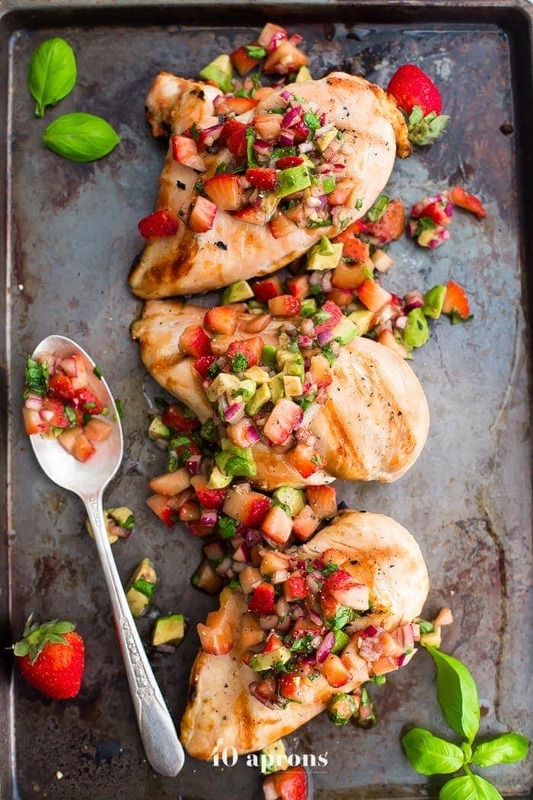 Remove chicken from grill and let rest 5 minutes then serve with strawberry basil avocado salsa. So delicious and easy!! Big hit and I will make it again for sure!!! What’s a good side dish for this recipe? Some leafy greens would be great alongside this dish! A salad, sauteed kale, sauteed spinach, etc. Or maybe some simple but well-seasoned cauli rice! WHOOOOOOOAAAA this looks divine! Definitely adding this to my menu this week. I don’t know where but something else is getting booted so we can make this!